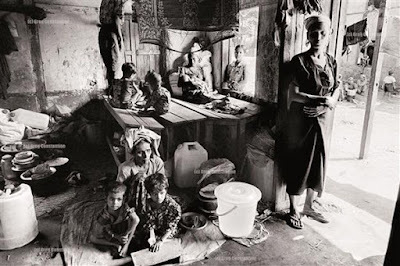 ISTANBUL – An award-winning photographer who has an exhibition on Rohingya Muslims currently running in Istanbul says Turkey has a particular relevance to his work. “Istanbul is very strategic because Turkey is one of the few countries in the region that has actually shown a considerable amount of concern for what is happening to the Rohingya community,” Greg Constantine told Anadolu Agency this week. “Inside Burma [Myanmar], the conditions the Rohingya live in are quite like apartheid… They are confined to one geographic area; they can’t come, they can’t go… They receive very little medical assistance or education for their children,” he adds. Exiled to Nowhere: Burma’s Rohingya is a collection of photographs from Constantine’s 12 visits to Myanmar. It focuses on persecution and human rights violation against the Rohingya community, and was previously held in Washington, Bangkok, and Geneva. Constantine says he made his first visit to Rohingya communities in Myanmar’s volatile Rakhine state in 2006, and has made eight subsequent trips. Rakhine is the home to most of Rohingya community. Since June 2012, the predominantly Buddhist country has been grappling with sectarian violence, outbreaks of which have left hundreds dead and more than 140,000 Rohingya confined to internal displacement camps in Rakhine. In recent years, around 130,000 Rohingya have also fled the country by sea, according to the United Nations. “I was so shocked by the situation that the Rohingya were living in there,” says Constantine, accusing the international community of paying little attention to the community. Constantine’s haunting images show families confined to bamboo shacks, malnourished potbellied children walking among slums, and Rohingya gathered in impoverished conditions, trying to eke out an existence from the land. One image shows three covered Rohingya women staring out of the darkness. It’s as if the suffering those eyes have seen reaches out to you. As a freelance photographer, Constantine – who says he covered most of his costs through grants – had the freedom to spend long periods of time with the Rohingya. “I like to talk to people quite a lot. And I always ask people if they are compatible with me taking pictures [so as not to invade their privacy],” he says. He says getting people to talk with the aid of a translator, however, was not hard. “The Rohingya community has been so oppressed for so long they want their stories to be told,” he says. Constantine says that his visits took mainly 2 to 3 weeks, although his last trip – in Nov. 2014 – took just three days. No matter how stark and thought provoking the images – some, it has to be said, hauntingly beautiful in their capture of suffering – Constantine says he is not in Turkey to sell his images. “I focus on the root cause of the problem and that is the oppression that they face in their homeland – which is Burma,” Constantine says. Exiled to Nowhere: Burma’s Rohingya, runs until July 30 at Galata Fotografhanesi in Istanbul’s Beyoglu district.